Teenage versions of DC Comics superheroines both attend high school and fight crime to protect the citizens of Metropolis. It's Spring Break and the Mane 7 are about to board the most glorious yacht ever for a relaxing cruise. But Rainbow Dash is convinced that Equestrian Magic is on the loose and won't let anyone rest until she finds it. This leads to disaster on the high seas, a trip to Ponyville, and the ultimate discovery that Equestrian Magic related to the Storm King has seeped into their world and is threatening everyone on board the yacht. Sunset Shimmer: [surmising the situation] That wasn't quicksand back there. The sand was covering a portal to Equestria. I thought there was only one from school to Celestia's mirror, but who knows how many there are and where they might lead? Twilight Sparkle: Sorry, I wasn't listening. Because we're PONIES! Rainbow Dash: Y'know, Twilight, since I kinda messed things up on the boat, maybe this could be your vacation! 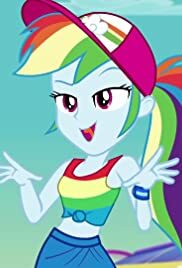 Rainbow Dash: We're here, we're ponies, let's have some fun! Pony style! Whoa! Sunset Shimmer: Uh, that's not a thing we say.